The Public Test Server is now online since 3 days for people who applied for the ETF and so far it seems to be running pretty good. Based on various user comments, only 8-10 hours are needed to reach the highest World Tier 4 as well as to find and equip one or more complete Gear Sets. 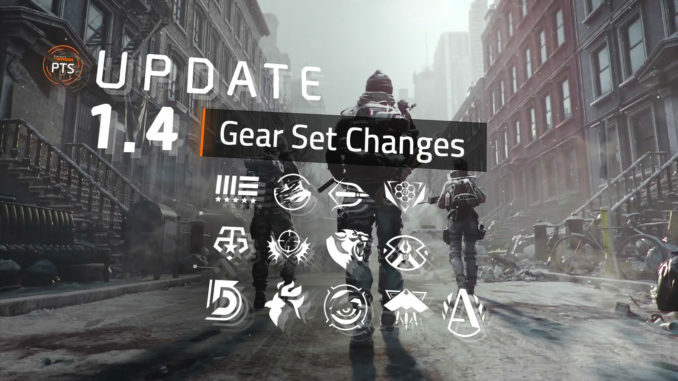 Lots of things regarding Gear Sets have been changed, some of the sets received heavy buffs and others nerfs to put them all on the same level again. Keep in mind that stats and numbers are still subject to change throughout the PTS phase and until Update 1.4 gets released. Every hostile NPC, also those you’ll encounter in the Open World, can drop Gear Set items. New maximum Gear Score is 229, which means that all currently existing Gear Set items will be adjusted in terms of their GS, main stats and set bonuses. Gear Set items can have a Gear Score of 163. The four-piece bonuses of Gear Sets have been rebalanced. Two-piece bonuses will focus more on utility instead of stat bonuses. Five-piece bonuses (from Sentry’s Call and Striker’s Battlegear) have been removed from the game. More information about gear changes and balancing in general. There are 2 big changes coming to loot weighting in The Division’s next update. It will still be there to some extent, but all activities (Dark Zone, Incursions, Underground, HVTs, etc.) will have a chance to drop an item of any Gear Set. As a result, you are not bound to Falcon Lost anymore if you are looking for Sentry’s Call or Tactician’s Authority. Instead, every Incursion will guarantee you some certain gear piece of the one or other item category, which allows you to specifically farm for a Gear Set item you really need in order to complete a build. The way this works is not carved in stone yet, so feedback on reddit or in the official PTS forum is highly appreciated. Last but not least the list of all currently available Gear Sets with their preliminary stats and bonuses in Update 1.4. No new Gear Sets will be added within this next patch. Every consecutive hit deals 1% more damage. Stacks up to 100%. Missing shots drop bonus by 2%. Bonus is reduced by 1% every second. Nomad’s Resolve – Administers a constant small heal, allowing the user to heal passed the segments of the healthbar. When receiving fatal damage, you are instead healed to full health. Can occur once every 4 minutes. Every bullet you and your group lands on a hostile adds 0.2% skill power to you for a max of 30% bonus. Bonus lasts for 10 seconds of not being refreshed or 10 seconds of being at max. Headshots using semi-automatic weapons mark the enemy, increasing the damage inflicted on the target by 5% for a duration of 30 seconds each. A target can receive up to three marks. When in range of hostile grenades or mortars, defuses them and adds grenades to your inventory. Can only happen once every 15 seconds. Hitting an enemy with a bullet grants you and your group temporary protection. The further your shot, the more protection. Each group member’s protection disappears after getting hit by one hostile bullet. When the weapon is holstered, it regains full ammo. Talent | Hit 10 shots without switching target to make the target take damage over time for 50% of the total amount of damage already done by those bullets. While Consumables will lose their Status Effects (see here), the Bleed Effect on the Predator’s Mark Gear Set is still proccing, making it very strong at the moment against other players in the Dark Zone. As said before, this could change at some point during the test phase. The B.L.I.N.D. Gear Set as we know it will not exist any longer and be replaced with the following set called Banshee. While Rogue, all ammo is completely refilled every 30 seconds. Damage taken from non rogue players reduced by 10%. While not Rogue, Damage to Rogue players is increased by 10%. No Dark Zone XP or Currency is lost on death. Note: All existing pieces of B.L.I.N.D. will be replaced with equivalent Banshee pieces. Your damage is increased by 15% against burning targets. Consumables and special ammo used now apply to the whole group and are not consumed on use. Triggers consumable cooldowns and cannot start consumables that are on cooldown. If your Primary and Secondary Weapon is of the same category, they both gain all of the unique active talents. Talent | When zoomed, marksman rifles lose headshot damage bonus, but gain 100% critical strike chance.